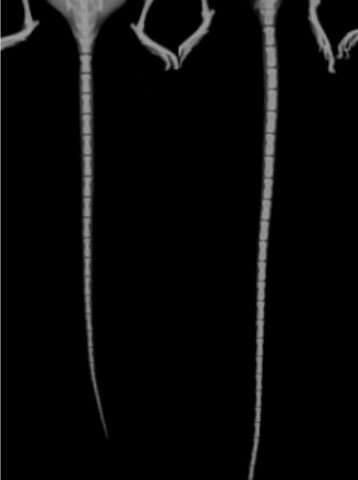 Researchers from two groups studying mouse development have accidentally created mice with unusually long and unusually short tails. Their findings, publishing January 17 in the journal Developmental Cell, offer new insight into some of the key aspects controlling the development of tails in mice and have implications for understanding what happens when developmental pathways go awry. "The same regulatory networks that control mechanisms regulating how a body pattern is formed are often coopted for other developmental processes," says Moisés Mallo, a researcher at Instituto Gulbenkian de Ciência in Lisbon, Portugal, and senior author of one of the two papers. "Studying these networks can give us relevant information for understanding other developmental, or even pathological, processes." Both groups' findings are related to a gene called Lin28, which was already known to have a role in regulating body size and metabolism, among other functions. "We were trying to make mouse models of Lin28-driven cancer, but we were surprised to find that these mice had super long tails. They had more vertebrae," says George Daley, an investigator and dean at Harvard Medical School and senior author of the other paper. His team was studying the Lin28/let-7 pathway, which regulates developmental timing and has been implicated in several types of cancer. Mallo, on the other hand, was studying a gene called Gdf11, which was already known to be involved in triggering the development of the tail during embryonic development. In his lab, they found that mice with Gdf11 mutations had tails that were shorter and thicker than those of regular mice. "They also contained a fully grown neural tube inside, as opposed to a normal tail that is essentially made of vertebrae," Mallo says. "We were able to pinpoint the Lin28 and Hox13 genes as key regulators of tail development downstream from Gdf11." Both pathways relate to the development of somites, which give rise to important structures associated with the vertebrate body plan. These blocks of cells eventually differentiate into dermis, skeletal muscle, cartilage, tendons, and vertebrae. As mammals develop, the somites are laid down sequentially along the body axis. 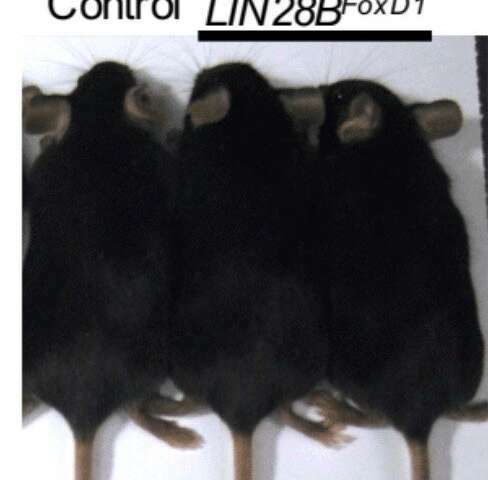 Lin28 plays a role in regulating the timing of this repetitive process. "From my perspective, one of the most important findings of our work is that a group of multipotent cells that build both the somites and the spinal cord are regulated by fundamentally different genetic networks and have different cell competences at two consecutive stages of development," Mallo says. "This finding goes beyond the trunk to tail transition, possibly acquiring relevance in pathological processes like the initiation of metastasis." "There are also important implications in this research for understanding evolution," says Daisy Robinton, a researcher at Harvard and first author of the study from Daley's lab. 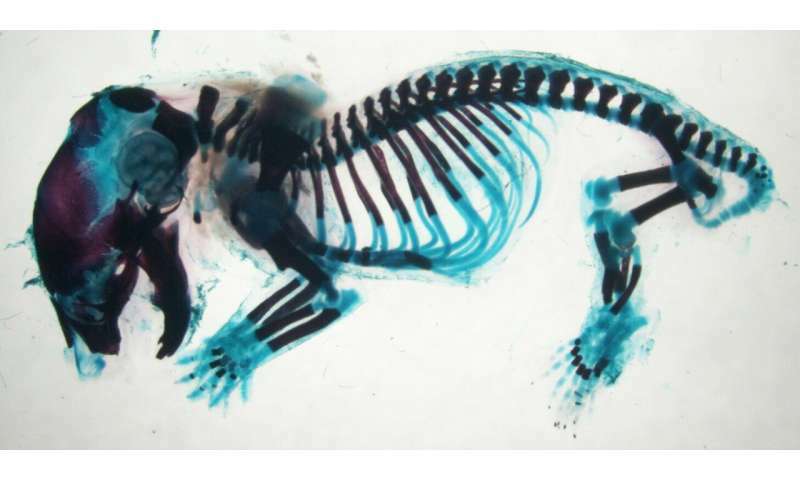 "Anterior-posterior axis elongation is an important feature in bilateral animals, and natural selection has created a variety of tail lengths to suit different evolutionary pressures. Until now, little was known about how length is controlled and how the manipulation of genetics can impact morphogenesis."